The Hutchinson Grain Pump is a continuous loop grain conveying system that moves grain between the many operations required by an efficient grain handling system. The Hutchinson grain loop can replace all of the traditional conveying systems (vertical conveyors, vertical bucket elevators, chain conveyors, grain legs, and drag chain conveyors) with one versatile grain handling system. The Grain Pump is a continuous loop of chain conveyor and galvanised tubing encircling your bins at the bottom and around the top, enabling the connection of many bins into one grain system, that can be selectively filled and emptied with ease. The innovative Hutchinson Grain Pump™ lets you move grain with gentle efficiency and at high capacities using a very simple and powerful chain conveyor system, in an enclosed loop. This loop chain conveyor will both elevate and conveyor your grain horizontally all with one simple piece of equipment. Compared to the traditional bucket elevator / level drag conveyor system design the loop conveyor accomplishes all of the same tasks with one piece of equipment that would require as much as 10 different pieces in the traditional way of handling grain – obviously there are going to be some cost savings with the loop conveyor. The other obvious savings is reduced maintenance cost, if you have one piece of equipment with one drive (loop conveyor) compared to the traditional bucket elevator system that achieves all the same tasks as a loop with 10 different drives – which do you think will produce more maintenance issues? The UHMW (Ultra High Molecular Weighted) paddles inside the continuous loop of tubing are designed to keep your grain flowing gently and evenly from inlet to discharge – just like the UHMW paddles you will see in traditional level drag conveyors these paddles prevent steel on steel contact in the conveyor which reduces wear and increases conveyor life. These round, plastic UHMW paddles cover most of the circle inside the pipe (notched on one side to allow the paddle to pass by the sprocket corners) which allows this chain conveyor to elevate the grain as well as convey it horizontally. The paddles move through the pump on heavy-duty chain designed specifically for the system and the loads presented. The closed-loop design offers the versatility to create a complete load-in/load-out system that also provides recirculation capabilities. One or more bins can be unloaded at a time into the loop. Reduced drying costs can be achieved with this innovative system by blending higher moisture and dried grain from one bin to another. The possibilities are nearly unlimited. Install the pump beneath a row of bins, or in an existing in-line system, the pump may be angled to pick up from conventional unload in front. The system may provide down-the-road expansion capabilities. Provides expansion capabilities. In the first phase of the system install large enough drive corners to allow you to extend the loop length to more bins in the future. 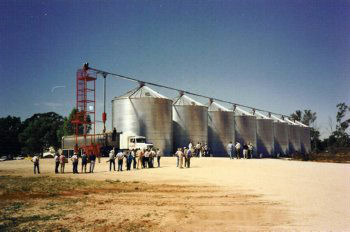 Can reduce drying costs by blending higher and lower moisture product from one bin to another. Can increase your volume of higher grades of grain by allowing you to easily blend off lower quality grains into higher quality at the push of a button.